1) On Tuesday, September 18, at 7:30pm, the Beacon Hill Hotel & Bistro and the New England Aquarium will co-host a “Celebrate Seafood Dinner,” a four course dinner, to raise awareness of the challenges facing the oceans and the benefits of sustainable seafood. Executive Chef Josh Lewin is committed to incorporating local products and sustainable practices into the Beacon Hill Hotel & Bistro’s cuisine in unique and innovative ways. To bring this delicious and educational feast to diners, Lewin worked alongside the Aquarium’s Sustainable Seafood Program to bring only the freshest, most sustainable ingredients to the table. Cost: $65 per person. $55 for New England Aquarium members. $25 for optional wine pairing. Reservations are mandatory and can be done by calling the Beacon Hill Hotel Bistro at (617) 723-7575. 2) Vittorio Ettore, Executive Chef and Owner of greater Boston’s Bistro 5 and A Tavola, has been in the food industry for 20 years. Born in Italy’s Tuscany region, Ettore began his first job in 1987 after his family had moved to Venezuela, as a busboy and then server at the top rated restaurant, Caballeria Rusticana, in Caracas. In 1990, Ettore and his family moved to Boston where his vast experience led him to open Bistro 5 in West Medford, and most recently A Tavola in Winchester Center. Chef Vittorio Ettore is a man who is passionate about his produce, particularly tomatoes. He has a torrid affair with the delectable fruit and includes them on his menu for only one month of the entire year. During the month of September he devotes an entire tasting menu to these seasonal beauties showcasing heirloom varieties alongside complementary basils. Each dish is carefully designed and executed resulting in highly memorable flavor and presentation for the senses. Cost: 3-course menu is $45 per person; $65 with wine pairings plus tax/gratuity. 5-course menu is $65 per person; $90 with wine pairings plus tax/gratuity. I have been to his Tomato dinners before and they are excellent, well worth going to. Such a fascinating range of different tomatoes and used in very creative ways. Check out this event! 3) On Thursday, September 13, at 6:30pm, the Olé Restaurant Group will host a Patrόn Tequila Dinner at Zócalo Cocina Mexicana, located in Boston, so that guests can get a taste for the full spectrum of flavors that the world’s finest tequila has to offer. For just $50 per person, guests are invited to indulge in four courses; each paired with a Patrón Tequila picked to match the flavors of the dish. To start, Bocoles with Pork, a corn patty stuffed with shredded pork, will be complemented by Patrón Reposado, a perfect sipping tequila featuring a harmony of agave and oak wood flavors. Next, guests will enjoy Caldo de Camaron, a shrimp soup paired with Patrón Anejo to bring out the sweet flavors of the seafood, followed by a Turkey Enchilada with Coloradito Mole. This shredded-turkey stuffed corn tortilla covered in a homemade coloradito mole sauce will be paired with Patrón Gran Platinum, an ultra smooth yet sweet tequila that will stand up to the flavors of the mole. For those with a penchant for dessert, there will be Café de Olla Little Cake made with lady fingers and a cream cheese pastry cream paired with Patrón XO Cocoa to end the night on a sweet note. Cost: $50 per person plus tax and gratuity. Reservations are required so please call Zócalo Cocina Mexicana at (617) 456-7849. 1) "Tiki culture is all about living the good life; listening to music, enjoying exotic drinks and taking it easy." China Blossom Restaurant & Lounge, located in North Andover, may be thousands of miles away from the nearest tropical escape, but on Saturday, September 8, its outdoor space will transform into a tropical oasis complete with the sights, sounds, smells and tastes of the islands at the first annual Tiki Time Festival. This free event, sponsored by WXRV 92.5 The River, Kona Brewing Co. and WAITIKI, a Boston-based collective that promotes the revitalization of mid-century tiki pop culture, will be an afternoon of fun for all ages. From 1pm-5pm, guests will be met with a traditional Hawaiian lei greeting as they are transported to a Polynesian paradise. The afternoon’s emcee, 92.5 The River’s on-air personality Carolyn Morrell, will get the party started with performers from Polynesian Dance Arts performing authentic Hula and Tahitian dances before they invite guests to try the moves themselves. Afterwards, the Kahiki Serenaders quartet will bring island sounds to the stage, playing live vintage Hawaiian music on the drums, double bass, piano and vibraphone. Things will really heat up with a gripping fire performance from the circus group A Different Spin featuring torch juggling, fire eating, a fire hoop, fire swords and other daring feats. All afternoon a face painter will transform faces with tiki-inspired designs and a balloon artist will create tropical balloon animals to set the scene and keep kids entertained. All afternoon China Blossom Restaurant & Lounge will serve Polynesian-inspired food including a whole pig roast, beef teriyaki skewers, shrimp skewers, corn on the cob and pork fried rice all for only $1 per serving. Tropical slush and exotic sorbet will also be available for purchase along with assorted juices, non-alcoholic Pina Coladas and beer and wine served from an outdoor cash bar. Kona Brewing Co. will bring the aloha spirit to China Blossom all day with special giveaways and complimentary samples of its Big Wave Golden Ale, which will be hitting mainland stores for the first time this fall. Kona is a Hawaiian brewery with six ales and lagers available in select states, as well as Japan. Food & Drinks available all day. Attendance is free with RSVP. Food, soft drinks, beer and wine available for purchase at outdoor cash bar. Please visit http://www.chinablossom.com to RSVP and for more information. 2) Chocolate, chocolate and more chocolate will take over The Langham, Boston when the iconic hotel launches its renowned Chocolate Bar in Café Fleuri Saturday, September 8. The 24th year of the legendary “All-You-Can-Enjoy” dessert paradise will bring more than 120 chocolate combinations to New England. Also re-joining the hotel’s culinary weekend line-up is the Sunday City Brunch buffet. The decadent Chocolate Bar features stations with varying levels of chocolate intensity and flavors – from white to dark and everything in between. A DJ plays hit music to set the tone where families indulge in close to 200 pounds of premium chocolate each Saturday. A never-ending supply of cupcakes, truffles, brulees, bread pudding, crepes, whoopee pies and more take center stage while Executive Pastry Chef Jed Hackney creates rotating items with fresh, seasonal ingredients such as September’s lemon madeline with ivoire cremeax and strawberries, and a caramelized white chocolate torte with banana and sesame. The chocolate cocktail menu features cocoa-infused martinis like the “Chocolate Decadence” with raspberry vodka, dark chocolate Godiva liqueur and Frangelico and the “White Coco” with vanilla vodka, dark chocolate Godiva and white crème de cacao with cream. Café Fleuri’s City Brunch marks its return Sunday, September 9. While live jazz music fills the air, Chef Sapienza takes diners on a culinary journey with flavors across New England and beyond at one of the city's most elaborate Sunday buffets. City Brunch features a wide array of culinary options including traditional breakfast items, made-to-order omelets, carving stations, a raw bar, sushi prepared by our in-house sushi masters and more. Instead of the usual bread basket, Café Fleuri offers diners its complimentary signature beignets, a popular fried French pastry. A children’s station sits lower to the ground and offers kid-friendly classics such as brick oven pizza, miniature hot dogs, chicken fingers, mac and cheese balls and fresh fruit skewers. To complete the experience, diners can sip on a morning cocktail from the Bloody Mary and Mimosa bar and finish their meal with a dessert sampling from the Chocolate Bar. Saturdays; September 8, 2012 through June 22, 2013, from 11am–3pm. 3) Fleming’s Prime Steakhouse & Wine Bar is unveiling their newest wine collection and celebrating a “Month of Discovery,” featuring a series of unique wine events and food offerings that will appeal to both wine novice and true connoisseur. The New Fleming’s 100, Fleming's proprietary collection of 100 wines by the glass is a unique approach to discovering and celebrating wine without having to order an entire bottle. "Wine is an intensely personal choice, and wine by the glass is the perfect way to celebrate it," says Maeve Pesquera, Fleming's Director of Wine. The new collection for 2012/2013 features many iconic wineries from California as well as top-rated European wineries. The international roster also includes a number of remarkable wines from Chile, Argentina, Australia, New Zealand and South Africa. "Pinot Smackdown" (September 7) -- Pinot Noirs from California’s Central Coast compete against Pinot Noirs from Sonoma, Oregon and the Anderson Valley. "Battle of the Hemispheres" (September 14) -- California takes on South America, Australia, New Zealand and South Africa. "Old World vs. New World" (September 21) -- European masters from France, Italy, Germany and Spain go against the best and brightest winemakers from California. "Glass Warfare" (September 28) -- Premium wines and value-priced wines made from similar grapes are put to the taste test. Fleming's New Memorable Meal for Two: Fleming's celebrates its new wine collection with a prix-fixe menu for two, available from September 1-30. Each guest will enjoy a triple entrée of broiled filet mignon, herb baked shrimp and braised short rib, with shrimp bisque and a dessert of frozen almond soufflé. The 3-course menu is priced at $99 for two, and $49.50 for one. For an additional $25, each guest may order a specially priced flight of three wines -- The Prisoner, Primus Cabernet and Quintessa 2006 -- all from the Huneeus Vintners Portfolio. What is the best introductory wine book? Which book would you most recommend to a newcomer to wine who wants a basic wine education? Such a book should be comprehensive yet not too detailed. It should be easy to read, not pedantic or snobby. It should make wine fun, reveling in its wonders and diversity. There are a number of books that qualify under these standards, yet one of the ones I most often recommend is written by Kevin Zraly. 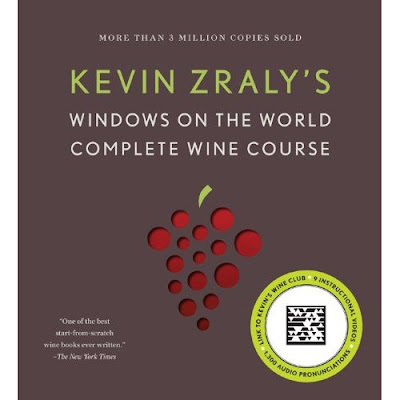 I have read a number of the prior editions and recently received a review copy of the latest paperback edition of Kevin Zraly's Windows On The World Complete Wine Course by Kevin Zraly (Sterling Epicure, September 2012, $19.95). This is a trade paperback of 324 pages. Zraly is the founder and teacher of the Windows on the World Wine School, now in its 33rd year. He is well respected as a wine educator, having garnered many awards, including a James Beard Lifetime Award. Each edition is updated and revised, though the basic format is largely the same. The book is essentially broken down into 11 chapters, with an Introduction and Glossary. The brief Introduction details some of the fascinating changes in the wine world that Zraly has witnessed from 1970-2010. Then, the initial chapter is Prelude to Wine, which provides a brief summary of basic wine matters, from how it is produced to how to taste it. The bulk of the book is a description of the wines of the world, with a strong emphasis on France and California. For example, France receives three of its own chapters while Spain and Italy share a chapter. The book ends with a chapter entitled The Greater World of Wine, and is a compilation of essays on wine topics, like food/wine pairing, with a number of wine recommendations too. Each chapter has a section of main content, often answering common questions about wine, while including numerous items of related wine trivia in the margins. I find some of the trivia fascinating, and most wine lovers, of all knowledge levels, would probably do so as well. Each chapter about a country's wine usually provides some recommended producers and vintages. As this book is designed for beginners, and is not intended to be fully complete, some of the information on certain wines and countries can be fairly minimal. But as the wine world is so vast, it would take a book much bigger to do just to all wines around the world. This sometimes presents a small problem, that some of the provided information may not be fully accurate or complete. Unless the reader understands that fact, they might assume they know more information than they actually do. For example, the Champagne section states only 3 grapes are used to produce Champagne, though legally 7 grapes can be used. The other 4 grapes may be rarely used, but they still are used by a few producers and it is incorrect to say only 3 grapes are used. In the Sherry chapter, it mentions only 2 of the 3 grapes used to make Sherry, excluding Moscatel for unknown reasons. But these are minor quibbles in a book geared for beginners. In this edition, a number of smart tags are also provided, basically QR codes, which you can read with your smart phone if you download the necessary app. Or, you can just type in the URL listed below the code. These codes unlock 9 instructional videos and 1300 audio pronunciations. At $19.95, this book is an excellent value, a great way for a novice to gain an overview of the world of wine. More experienced wine lovers won't find as much value in the book, though some of the trivia might intrigue you. With the holidays approaching in a few books, this would make for a nice present for someone seeking to learn about wine. I love how Twitter can connect people from all over the world. Recently on Twitter, I was contacted by George Davis, the General Manager of Chives Canadian Bistro in Halifax, Nova Scotia. George was making plans to visiting Boston in September and wanted some recommendations. This was days before I was to leave for a visit to Nova Scotia. I checked out the website for his restaurant and was intrigued by its philosophy and menu. I had been seeking a place to dine in Halifax and had not previously checked out this place. In the end, I made reservations to dine there during my trip. Chef Craig Flinn opened Chives in December 2001 and since then it has gained quite an excellent reputation. For example, the Coast City Guide: Best of Halifax 2012, an annual guide, awarded Chives a Gold as Best Fine Dining, a Gold to Chef Flinn as Best Chef, and a Gold to Chives for Best Use of Local Ingredients. The Chives website states: "The restaurant menus are based on seasonal produce from local farmers, artisan cheese and meat producers, and sustainable seafood with the core menu changing every 6 to 8 weeks. The bistro’s clientele enjoy contemporary Canadian bistro dishes rooted in European culinary history." The medium-sized restaurant is casual but with an intimate feel, and the decor evokes a sense of nature, from its colors to the unique tree sculpture near one wall. There is a bar in the main dining area but it is not a place to sit, but rather a place for their bartender to work and servers to pick up drinks. On some of the walls were a series of rather unique paintings, old buildings that lacked any windows. The tables are spaced far enough apart so you don't feel crowded and have an element of privacy. You will feel very comfortable here, a place for an intimate dinner or a get together with some friends. Chives emphasizes local ingredients and has not failed to follow through with this philosophy on their wine list. Though their wine list contains wines from all over the world, they also sell seven Nova Scotia wines by the glass and fifteen by the bottle. Plus, they sell about 9 other wines from other parts of Canada. Glasses are available in either 5 ounce ($7.25-$10.75) or 9 ounce ($13.25-$19.50) pours, and the list has a fair-sized selection of wines priced $36-$60 a bottle. Markups seem fairly reasonable, with a number of bottles priced under 2X the usual retail price. For example, the 2008 Caymus Cabernet Sauvignon, often found at retail for about $75, only costs $110. Wine lovers will fine plenty of wines to interest them on this list. We decided to stick to Nova Scotia wines, to get a small sense of the current state of their wine industry. I have had Nova Scotia wines before, and even visited a few of their wineries, but it has been a number of years since my last experience. Since then, new wineries have opened and I figured that the overall quality of their wines had likely improved as well. Based on the five wines we tasted, I was impressed and think a deeper exploration of their wines is warranted. My favorite of the wines was the 2011 Blomidon Estate Rose, of which I have previously raved. It was an excellent food wine and something I could easily enjoy on its own as well. The Benjamin Bridge Nova 7 was a pleasant apertif, a sparkling wine made from New York Muscat and Pearl of Csaba grapes. It has intense aromatics, reminiscent of Muscat, with delightful green apple, orange and melon flavors. Crisp acidity, hints of sweetness and a light effervescence make this a fun and delicious wine. The Avondale Sky The Landing is made from the Leon Millot grape and is an opaque red, almost purple, in color. It is easy drinking with intense cherry flavors and hints of spice, especially on the finish. Not too complex, but a very pleasant wine. The Jost Vineyard Cote St. George is made from the Marechal Foch grape and was light and smoky with subtle red fruit flavors. This would be delicious with some BBQ or a hearty pasta dish. And if you don't like wine, they have a fully stocked bar with a list of special cocktails ($8.25) and martinis ($10). The food menu is small, based on seasonal and local ingredients, but with plenty of interesting choices. They usually have 7 Appetizers ($8.99-$12.99), 7 Entrees ($23.99-$28.99) and 4 Desserts ($4.99-$9.99). The size of the menu is not a negative in the least. I also like the fact that they provide 2 wine recommendations for each dish on the menu, making it much easier for customers to decide on a pairing. Besides the regular menu, there will usually be at least a few specials of the evening too. The menu includes vegetarian options, gluten free choices, as well as noting which menu items can be modified to gluten free. In addition, I suspect that if you have food allergies, they will cater very well to you. Entrees come with a buttermilk biscuit, served in a paper bag, with soft butter and molasses. A great start, both flaky and soft, and shows that Southerners are not the only ones to make good biscuits. My only minor quibble is that you must pay for extra biscuits ($0.75), though many other restaurants provide additional bread or biscuits for free. And that is my only complaint about the entire meal. For appetizers, we chose two different ones. The Farmer's Market Salad ($9.99) varies dependent on what is available at the local market. Our salad came with greens, peaches, Dragon's Breath Blue Cheese (from Nova Scotia), almonds, and topped by a balsamic dressing. The ingredients were quite fresh and meshed well together. The blue cheese was on the mild side yet flavorful and the peaches were lush and juicy. A refreshing and tasty beginning. The General Tao's "Bacon" ($10.99) is a generous piece of braised Nova Scotia pork belly topped with a ginger sesame glaze and placed atop a crunchy cashew coleslaw. The pork belly was tender, with a compelling Asian glaze, making for a decadent dish. The cole slaw was also intriguing, with the addition of a crunchy texture and nutty flavor from the cashews. The restaurant provided us a complimentary middle course, their version of a New Orleans Po' Boy Sandwich. They topped a soft brioche bun with flash fried local oysters and a chipotle corn relish. My picture above is missing the top part of the bun, just so you could get a better view of the inside of this scrumptious sandwich. This was a perfect sandwich with clean, crisp oysters and a compelling relish that had a delightful spice and slight crunch. The soft, buttery bun complemented the sandwich and didn't overpower the oysters with too much bread. I could have easily eaten two or three of these sandwiches. For entrees, one of our choices was the CCB Surf N' Turf ($39.99/market price), which includes a Prince Edward Island beef tenderloin, grilled sea scallops, spinach and old growler gouda risotto, candied field tomato, and buttermilk onion rings. The tenderloin, which is organic and grass fed, was ordered rare and it was cooked perfectly, absolutely tender and the sauce added plenty of savory flavor to the umami-rich and gamey beef. The scallops had a nice char and the tomato was juicy and tasty. A big surprise was the risotto which I didn't think I would like because of the spinach. Yet it was fantastic, bursting with flavor, a great texture and a pleasant creaminess. You would never have guessed it had spinach. An excellent dish and highly recommended. Our other entree was one of the nightly specials, a Lobster Tagliatelle ($26.99) with homemade pasta and plenty of lobster. The thin tagliatelle was cooked nicely, a good al dente, and the sauce was creamy without being cloying, complemented by the sweet lobster. This was a large portion, though I did pretty well in completing most of it. A good choice, I would also highly recommend this as well. We were fairly full by the end of dinner so decided to split a simple dessert, some Peach Sorbet, accompanied by whipped cream and a fruit sauce. The sorbet is made on premises and was refreshing, with a rich and fresh peach flavor. The restaurant also provided us complimentary glasses of a Jost Vidal Ice Wine, which had plenty of good acidity that balanced the mild sweetness, and flavors of apricot, dried fruit and honey. Our server was George, and the service was excellent. The restaurant was fairly busy for a Monday night and everyone else seemed to be quite satisfied with their service and food. The quality and quantity of the food is well worth their reasonable prices, and the wine list is interesting and affordable. It was an impressive dinner and I give Chives my highest recommendation. They have a great culinary philosophy, serving local, seasonable ingredients, and the cuisine, though often familiar in many respects, has plenty of excellent creative touches as well. I will return here again the next time I visit Nova Scotia. Rant: Are Beer Drinkers Cheap? At the Beacon Hill Wine & Gourmet in Melrose, a large portion of customers purchase beer and I hear some of their comments on beer prices. Plus, I have spoken to a number of friends and others about beer prices. Based on their comments, it seems to me that beer drinkers may be cheaper than wine drinkers. I am very curious as to why this might be the case. In a usual six-pack of beer, each bottle is about 12 ounces and thus a six-pack is the rough equivalent of three bottles of wine. Many six-packs cost under $10, and even most of the higher end bottles cost less than $20. That would mean the six-packs are equivalent in cost to wines that run from $2-$7 per bottle, quite a low figure. Yet a fair number of people complain about these prices, which are comparatively very low. There are some single 750ml bottles of beer which often cost between $10-$15, yet those are not the norm and are often seen as quite expensive. Yet many wine drinkers don't see any problem buying a bottle of wine that costs $10-$15. There are few beers that cost over $15 per bottle, yet you will find plenty of wines that cost more than $15. Why are there so few beers over that price point? Are most beer drinkers just too cheap to pay more than that for a brew? There are a few exceptionally priced beers, such as the Samuel Adams Utopia, which can cost about $150 per bottle. This seems to be very popular and they seem to have little problem selling this product. But who is buying it? Is it only a tiny segment of beer drinkers, and maybe those who also enjoy wine? What would make beer drinkers, who generally seem to prefer low cost beers, be willing to pay so much for a beer? Are the price variations between beer and wine due to the different costs of production? That might contribute a bit to the price, but we also know that reputation inflates the price of a number of wines far above the actual costs of production. Does reputation count so much less for beer producers? Is beer just less complex than wine, and thus not often worth as much as wine? I am not a beer drinker, because I dislike the taste of most beer, so maybe I am missing something. Can anyone enlighten me? Are beer drinkers cheap, or am I missing something? This past Wednesday, I was the guest host on #WineChat, a weekly online discussion on Twitter, and the topic was Sake. Beginning with some basics on Sake, the discussion quickly transformed into an intense Q&A and I spent much of the hour typing responses to everyone. The discussion was very well received, and numerous people voiced their pleasure at learning so much about Sake. The passion and excitement about Sake was contagious and some of the attendees were even drinking Sake at home while they participated in the discussion. I did the same, opening a Sake that was new to me, the Nishiyama Kotsuzumi ("Little Drum") Tokubetsu Junmai. The Nishiyama Brewery, which was established in 1849, is located in the middle of a mountain range in the Hyogo prefecture. The name "Kotsuzumi" came from a famous poet, Kyoshi Takahama, who tasted some of the Nishiyama Sake and described it, in a poem, as like a kotsuzumi, a "beautiful ancient small hand drum." They brew their Sake with some rarer ingredients, including their yeast and some of their rice. For example, they use Ogawa 10th yeast, which is notoriously difficult to use but which creates a delicate, subtle aroma. This Tokubetsu Junmai ($27.99 for 500ml) is made with a local, rare rice called Hyogo Kita Nishiki and the rice was milled down to 65%. It also has a Sake Meter Value of +9, meaning it is more on the dry side. This Sake possessed a subdued aroma, an intriguing whiff of steamed rice combined with nutty elements. On the palate, it was very dry, crisp and full bodied with a pleasant blend of flavors, including marshmallow, almonds, and caramel, reminding me in some respects of an aged Sherry. The finish was pleasing and fairly long, and I certainly yearned for more. Over the course of the evening, two of us finished the bottle and I would certainly buy it again, and it earns a hearty recommendation. 1) For 20 years, Taste of the NFL has been working to kick hunger at their annual charity event held on the eve of the Super Bowl. On September 12, past Taste of the NFL participant and restaurateur Steve DiFillippo (Davio’s Northern Italian Steakhouse; Avila Modern Mediterranean) will team up with the organization and some of Boston’s top chefs to host a kickoff event benefitting the Greater Boston Food Bank. This evening features gourmet bites paired with pours from famous California vineyards such as William Hill Estate Winery, Louis M. Martini Winery and MacMurray Ranch. Participating chefs include: Davio’s Northern Italian Steakhouse’s Rodney Murillo (preparing gnocchi Bolognese); Olé Restaurant Group’s Erwin Ramos (preparing beef barbacoa tacos); Deuxave’s Chris Coombs (preparing duck liver pate); Restaurant dante and il Casale’s Dante de Magistris (preparing chilled melon soup with prosciutto crumbles); Pigalle’s Marc Orfaly (preparing smoked trout fried rice with Chinese sausage, yellow leeks, Thai chilies and peas); and, Stella’s Evan Deluty (preparing salmon tartare with wasabi, soy and ginger). Guests will also be introduced to the 2013 Taste of the NFL program. All proceed of the evening will be donated to support the Greater Boston Food Bank in its fight against hunger. 2) On September 13, at 6:30pm, Legal Harborside will team up with Christina Turley, National Sales Manager for Turley Wine Cellars, for an exclusive four-plus-course wine dinner. "A popular California wine producer with wineries in Templeton and St. Helena, Turley wines are often recognized as some of the best old-vine red Zinfandels in California with fruits sourced from vineyards dating back to the late 19th and early 20th centuries. Turley Wine Cellars also boasts a two year waiting list for new recipients into their wine club." 3) On August 26, from 11am-3pm, Belkin Family Lookout Farm is hosting NECN’s TV Diner. Some of Greater Boston’s best chefs and restaurants will gather together for a day of food, family, fun and memories. The 2nd Annual Family Food Fest will include cooking demos, tastings, entertainment, children’s activities, hayrides, contests and more! NECN and TV Diner are proud to support local farms, like Belkin Family Lookout Farm, with farm-to-table foods. "Beauty is worse than wine, it intoxicates both the holder and beholder." A sense of aesthetics and a support of the underdogs in the wine world can be valuable traits for a wine blogger. Are you embracing both elements? Both are aspects I have discussed and promoted before, though Randall Grahm probably more eloquently addressed these issues in his keynote speech this weekend at the Wine Blogger's Conference in Portland, Oregon. Though I was unfortunately unable to attend the conference, Randall Grahm, of Bonny Doon Vineyards, was kind enough to post a copy of his keynote speech, Domaine Des Bloggeurs, on his blog, Been Doon So Long. You definitely should read it as you will find it both enjoyable and thought provoking. Two points especially spoke to me, issues of which I am in full agreement with Randall. Randall believes we need to embrace the nature of beauty, to see below the shallow surfaces and seek the inner wonders of wine. He wants us to share that beauty with others, to let our writing reflect such aesthetics. His words mirror some of my own thoughts. Last summer, I wrote Rant: Beauty & The Beast, urging wine and food bloggers to "...to embrace beauty, to praise it, to savor it, to share it." It was my desire that "...I would like to see more food and wine writers embrace the beauty, in what they experience as well as how they present themselves." This is an issue I continue to struggle with in my own writings, to try to convey that sense of beauty as best that I can. It is certainly not easy but it is a worthy endeavor, and will help to elevate your writing to a higher level. Part of the difficulty may be that sometimes beauty is hard to put into words. It can be a struggle to write about something which is better experienced than described. Do you aim for beauty in your writing? If not, why not? If so, how do you overcome the obstacles? This is also a sentiment I have often urged other wine bloggers to embrace, to write more about the underdogs of the wine world rather than the same old Cabernets and Chardonnays. As bloggers, we have the freedom to write about any topic we desire. We do not possess an editorial staff which might limit the potential topics of our posts. So we can embrace the unique, the unusual, the under-appreciated wines of the world. That is a powerful opportunity and we should grab the reins and charge forward with that chance. For myself, I have been more successful doing this than in my attempts at integrating beauty. I have often written about the compelling underdogs, hoping to entice more consumers to try them, to savor their pleasures. I have championed wines like Sherry, Port, Madeira and Grower Champagne. I have been an ardent proponent of Sake. I have discussed the joys of wines from places such as the country of Georgia, Israel, Nova Scotia, Greece, Uruguay and more. I have raved about unusual grapes such as Koshu, Saperavi, Chinebuli, Mtsvane, Tsitska, Malagousia, Roditis, Limnio, Mandilaria, and much more. I have highlighted small wineries all over the world, while discussing others who value terroir. I have tried to provide plenty of diversity, giving a voice to those wines which are often ignored by consumers and even a fair number of wine writers. So how much coverage do you devote to the underdogs of the wine world, those unique wineries and wines which truly need promotion? Or do you still concentrate on the big name countries, wineries and grapes? To improve ourselves and our writings, it is always good to take time every so often and ask ourselves questions like these. So read Randall's speech and think about the questions he raises. I feel sorry for grapes like Baco Noir, Marechal Foch and Seyval Blanc. Though they are used to make wine, they often get very little respect because of their parentage. These grapes are hybrids, not pure vitis vinifera like Cabernet Sauvignon or Chardonnay. Because they are not "pure," a fair number of people look down upon them, sometimes even shunning them. Is this grape racism? Shouldn't these hybrid grapes be judged by the quality of their wine rather than the identity of their parents? Vitis vinifera is the "common grape vine" and the one most used for making wine. All of the major grapes of which you are familiar are likely these types of grapes, from Pinot Noir to Syrah, from Sauvignon Blanc to Pinot Blanc. Hybrids are a cross of two or more Vitis species, such as vitis vinifera and vitis labrusca. They are often created by people seeking to create a hardier grape, especially for harsher northern climates. Because they are not pure vitis vinifera, some people turn up their noses at these hybrids, refusing to believe they can produce quality wine. Drop that pretentiousness and judge these wines by their taste. Sure there are poor quality wines made from hybrids, but there are plenty of poor quality wines made from vitis vinifera too. Yet there are some excellent wines made from these hybrids as well, and a wine lover would be hard pressed to guess they were hybrids simply from tasting the wine. You should approach a wine without prejudices or biases, willing to taste the wine and let it stand on its own. If you do so, you will probably find plenty of delicious wines that you might never have experienced otherwise. When I was in Nova Scotia last week, I dined at Chives, a restaurant located in Halifax which specializes in using local ingredients. Their wine list also includes a number of local, Nova Scotian wines, including the 2011 Blomidon Estate Winery Rosé. As I love Rosé wines, I was curious about this selection and our server gave it a hearty recommendation. So I ordered a glass and enjoyed it so much that I ended up ordering a couple more glasses during the course of dinner. Blomidon Estate Winery is located in the Annapolis Valley of Nova Scotia and they are committed to producing wines using only Nova Scotia grown grapes. That is an admirable mission. When I tasted the 2011 Rosé ($15.99 per bottle at the winery), I did not know what grapes were in the blend. I found it to be a crisp, dry, clean and refreshing wine, with subtle strawberry and watermelon flavors and hints of floral notes. It was far more Provence style than California, and paired very well with a variety of foods. It was easy drinking and would make an excellent summer wine, though I could easily drink it year round too. I would give it a strong recommendation. I later learned that this Rosé is a blend of three hybrids: New York Muscat, L’Acadie Blanc and Baco Noir. The Muscat is not actually from New York, it is just the name of the hybrid. From its taste, there was nothing that would have indicated to me that this wine was made from hybrids. It was very European in style, and you easily might have thought it was made from Rhone grapes. It was simply an excellent wine that any wine lover would have enjoyed, including any hybrid haters. So stop being a snob about hybrids and judge the wine on its taste, not its parentage. 1) Join me on Twitter this Wednesday, August 22, from 9pm-10pm EST for #WineChat. I will be the guest host for a discussion on Sake, that exciting and delicious Japanese alcohol. Everyone is welcome to join the talk on Twitter, and I will try to answer any Sake questions that you have. I will be talking about many different Sake topics, from food pairings to the basics of Junmai and Daiginjo. It is always a fun time on #WineChat so come join everyone on Twitter for this Sake discussion. 2) Did you know Russian President Vladimir Putin is a fan of warmed Sake? The Asahi Shimbun recently published an article, Sake brewers target overseas markets to survive, which discusses how Sake breweries in Japan are looking to exports to help their industry. As the article states: "Total exports from Japan hit a record high of 14,014 kiloliters last year, roughly double that of a decade ago, but they still represent just 2 percent of overall shipments." Almost 30% percent of exports are sent to the U.S. with South Korea and Taiwan occupying second and third place. Russia appears to be a promising market now too, especially when Putin admitted to enjoying warmed Sake. Guess with all those cold nights, warm Sake helps stave off the cold. 3) The Japan Daily Press echoed the sentiments of the Asahi Shimbun article. Their article, Sake sales improve, brightening prospects of industry resurrection, also notes how Japanese Sake breweries are increasingly looking toward exports to help them. For the fiscal year 2011, Sake shipments increased 1.2% over 2010, the first upward swing since 1995. Part of this is due to increased shipments of Sake from the Tohoku region, many people helping to support this area which was devastated by the March 2011 tsunami. 4) My next Tipsy Sensei story, The Fox & The Katana, should be published this upcoming week. It involves a kitsune, a fox spirit, who asks Nate, a Sake expert, to kill her mate. Her mate is also a kitsune and might be engaged on a murderous rampage, slaying many innocents with a katana, a samurai sword. Will Nate kill this deadly kitsune, or can he stop him in some other manner? Or is the kitsune actually innocent and Nate is being set up in some twisted game? Before this story is released, you should read the prior two tales, Yurine's Pot and The Ghost of a Ninja. I am also working on Tipsy Sensei #4, tentatively titled Demons, Gods & Sake, and it will be a novel. It took us about 12 hours to drive to Nova Scotia, a lengthy ride through the dark night, some fog, construction delays, and more. We journeyed there to attend a family wedding and stayed for five nights, at a hotel in Dartmouth near the waterfront. Though the hotel provided a continental breakfast, it certainly was not exciting. But culinary deliverance was just around the corner, at the Two If By Sea Cafe. The Cafe, which also has a location in Halifax, is owned by Zane Kelsall and Tara MacDonald and opened in November 2009. Zane is the coffee expert while Tara is the baking genius, and used to sell her baked goods at local farmers' markets. It is a medium-sized shop with tables inside as well as several tables outside on the sidewalk. It has a hip and casual coffee shop feel, a fine place to while away a part of your morning or afternoon. The menu is relatively small, drinks and baked goods, but that is a strength as they can concentrate their efforts onto those items. To drink, you can choose coffee, tea, hot chocolate, hot cider and more. Their coffee apparently receives raves though as I am not a coffee drinker, I did not partake. But I had some iced tea, which is freshly brewed and they will make iced tea from any of their teas, from black tea to white tea. It comes in a mason jar, with plenty of ice, and was quite refreshing and tasty. Their baked goods include muffins, scones, cookies, bagels and croissants (amazing!) though they limit the amount of each they bake. At the time of one of my visits, there were only two muffins ($3), including Mixed Berry and Carrot & Spice and two scones ($3), the Roasted Pepper & Basil and Lemon Poppy Seed. The flavors change frequently, considering what is in season, and they are all large, making them a good value. Though the muffins and scones were enticing, it is the croissants which stole my heart and I do miss them. They serve several types of croissants, including Plain ($3), Chocolate ($3.50), Almond ($4), Prosciutto & Cheese ($5) and their Special of the Week ($5). Like the other baked goods, these are big croissants, large enough that two people might even want to split one. They are heavier than the usual croissant, containing far more layers, and probably weigh at least twice as much than the usual croissant. Yet they remain flaky and soft throughout the croissant, each bite a pure delight. I fell in love with their croissants, and stopped there every morning to buy one or two. The plain croissants have a delicious buttery taste but the prosciutto & cheese was my favorite. The prosciutto added a salty flair to the croissant, and some of the ham that stuck out the ends was satisfyingly crispy. A perfect combination of ham, cheese and flaky bread. This is one of the best croissants I have ever tasted, putting to shame so many meager ham & cheese croissants. One of the Special croissants of the week was the Ain't Life Peachy, which contained peaches, vanilla, sugar, and toasted coconut. Another delicious choice, though I would have liked to see a few more peaches inside it. But the flavor combination worked very well, and it was not overly sweet. Another good choice. If you are in Dartmouth or Halifax, then you must stop by Two If By Sea Cafe for their croissants. They are well worth the stop and I bet you will love them as much as I did. When I return to Nova Scotia, they will be at the top of my list. Highly recommended! 1) BOKX 109 American Prime, a steakhouse at Hotel Indigo in Newton, announces the appointment of Stephen Coe as Executive Chef. A seasoned professional with over 20 years of restaurant industry experience, Coe excitedly joins the culinary team at BOKX 109 American Prime for the second time in his career. "A Massachusetts native, Coe was born into the culinary world and was filling doughnuts at his grandfather’s shop by the age of eight. Coe’s passion was quickly realized and he began competing on the junior culinary circuit for five years. Coe graduated from Johnson & Wales University (Providence, RI) in 2000 earning a Bachelors Degree in Culinary Arts, Pastry Arts and Nutrition and an Associates Degree in Culinary Arts and Business Management for Hotel Restaurants. Upon graduating, Coe brought his near-perfect GPA to The Country Club (Brookline, MA) where he delved further into his budding career doubling as the banquet sous chef and a la carte chef de cuisine. After four years, Coe assumed the position of pastry chef and sous chef at the seasonal five-star, five-diamond Topper’s at the Wauwinet (Nantucket, MA), a Relais Chateau Luxury Resort. During the off season, Coe was employed as private chef for The Chef’s Table (Pembroke, MA) where he was responsible for a myriad of tasks including menu development, servicing a celebrity clientele and business administration. In 2008, Coe became part of the BOKX 109 American Prime (Newton, MA) team as the sous chef under former executive chef Evan Percoco where he was an integral part of the seasonal menu development and nightly execution. Coe left BOKX 109 American Prime to open a 22 acre non-profit training and research bee farm, Hollow Tree Farm (Plymouth, MA). In the last five years, Coe also held executive chef positions at Alba (Quincy, MA) and Patrizia’s Trattoria (Plymouth, MA). Most recently, Coe has taken the food truck world by storm serving as a consultant for Food Truck Nation where he was responsible for conceptualizing and overseeing four trucks and three culinary concepts including Italian Street Food, Lobsta Lova and two Grilled Cheese Nations. To date, Coe has worked in 143 restaurant lines and credits stints in France and California as major inspirations for his aggressive style of cooking and intricate technique." Highlights from Coe’s updated menu include: Smoke Show! (pear and mascarpone sacchetti, mustard fruit, chive cream); Wood Grilled Octopus Carpaccio (arugula, picked red onion, tarragon, lemon vinaigrette); Grilled Oyster (pancetta, chive, fennel pollen, oreganata, chive fondue); Sesame Tuna Nachos (sriracha sour cream, wakame, pickled ginger, crispy wontons); Duck Fat Poached Sweet Breads (sorrel puree, frisee, crispy apple); Rabbit Trio (confit leg, bacon-wrapped loin, French rack, stewed butter beans, peperonata); Tournadoes Rossini (Marsala glazed filet, seared foie gras, confit Yukon potato, haricot vert); and, Brick Chicken Tagine (curried cous cous, almonds, apricots, dates, raisin agro dolce). Coe has also developed some sweets including: Frozen Lemon Semi Freddo (Pop Rocks, raspberry leather, blueberry soda); Levitate! (flourless chocolate cake, chocolate mousse funnel, tuille cookie, caramel popcorn); and, Smoke! (freestanding marshmallow crème brûlée, honey nougat, Graham cracker cookie, chocolate sorbet, cinnamon fire). Coe will also continue to dish out BOKX 109 American Prime’s signature cuisine including BOKX Cuts (the restaurant’s a la carte Brandt Beef selections, numbered by the sub-primal part of the animal they come from) and an array of Surf, Turf & Farm options. 2) On Saturday, August 18th, celebrate the kick-off of the second annual North Shore Wine Week at the Wine ConneXtion located in North Andover. From 12pm-5pm, sample wines specially paired with cuisine from participating North Shore Wine Week restaurants Oregano Pizzeria and Ristorante and Chama Grill. Mix and mingle at this complimentary event while sampling local culinary treats. Sponsored by Northeast FLAVOR magazine, in conjunction with NECN’s “TV Diner” and the Merrimack Valley Chamber of Commerce, North Shore Wine Week seeks to celebrate the North Shore as a premier destination for great wine and food. North Shore Wine Week will run from Sunday, August 19 through Sunday, August 26. 3) "No matter how you shuck it, nothing compliments the subtle nuanced flavors of an oyster like a crisp glass of champagne." As a toast to this classic food and wine pairing, Central Bottle is reveling in the final days of summer with a special wine bar event: Bubbles + Bivalves. The team at Central Bottle will be shuckin’ the ICOs (Island Creek Oysters, of course) and serving up a bubbly flight of Jean Vesselle Champagne and Movia Puro Rosato, a one of a kind Italian rosé rarely available outside of restaurant wine lists. Despite the change in the balance of power, English demand for Port continued into the 19th century, though the amount of wines imported from Portugal decreased. Between 1807-1816 AD, about 50% of the wines imported into England were from Portugal. This was a major decrease from when imports once reached around 66%. War soon came to Portugal. In 1806 AD, Napoleon Bonaparte, the Emperor of France, issued the Berlin Decree, forbidding the importation of British goods into any European nation either allied with or dependent upon France. This was the opening move of Napoleon's Continental System, a plan to isolate his enemy England. England responded in kind, with the Orders of Council of 1807 AD, forbidding trade with France. Portugal refused to follow the Continental System, choosing to continue trade with England, which greatly angered France. In 1807 AD, France crossed through Spain and invaded Portugal, thus beginning the Peninsular War. In November 1807 AD, the French army marched into Lisbon, reaching Oporto two years later. But, they were ousted from Oporto only three month later. France also eventually chose to attack their ally Spain, while England supported its ally Portugal. Fortunately, damage to the vineyards in the Douro was minimal as they were located in difficult terrain, not easily accessible to a marching army. France was eventually completely ousted out of Portugal and the Peninsular War would officially end in 1814. Napoleon's great defeat would come soon after at the hands of Arthur Wellesley, the Duke of Wellington, at the Battle of Waterloo in 1815. It is claimed that the Duke enjoyed some Port prior to the Battle of Waterloo, and as he was victorious the name of the 1815 Port vintage, which was an exceptional year, has become known as Waterloo 1815. As an aside, the noted wine lover Thomas Jefferson drank Port, but he preferred his Port to not have any added brandy. As a consequence, as nearly all Port possessed added brandy, then Jefferson probably bought and consumed very little Port. The Douro Wine Company, which had broken the English control of the Port industry, continued to operate until 1833 AD, though it was reinstated for ten year from 1843-1853 AD. Port production in the early 1840s reached a high of 100,000 pipes, with about 25% being exported to England. The Company's monopoly on Port though started to irritate even the Portuguese so it was about time for a change. In 1852, the Douro region was seized by Miguelites, who were loyal to the former King of Portugal, Dom Miguel. Dom Miguel had lost in a civil war and been exiled from Portugal in 1834. Yet he still had supporters within the country. The Miguelites held this region for about 18 months, destroying a brandy storage depot which also set fire to some Port warehouses as well. It is estimated that about 27,000 pipes of Port were destroyed, much of which flooded the streets and poured into the Douro river. The Douro Wine Company was broken up and other organizations took over its powers and responsibilities. It was also in 1852, that odium, powdery mildew, started to affect the vineyards in the Douro, leading to decreased yields. Almost ten years later, potentially as early as 1863 though maybe as late as 1868, the devastating phylloxera arrived. Fortunately, the American root stock was introduced soon enough before too significant of damage could occur. Portugal weathered these adversities and the Port industry continued to supply Britain and other countries. It is interesting that during the late 19th and early 20th centuries, it was common for people to drink sweet wines, such as Port, with their meals and rather than just before or after dinner. That eventually fell out of fashion, though there are reasons why maybe it should come back, or at least be considered for some dinners. The etiquette for drinking vintage port is also intriguing. Because of the likely sediment in the bottle, the Port is decanted, and many fancy decanters have been created for Port. The host will then first offer to pour a glass for his principal guest, who sits to his right. Next, the host fills his own glass and then offers to fill the glass of his guest on his left. The decanter then gets passed to the left, and each guest is expected to continue passing the decanter once they fill their own glass. If they fail to do so, they might be asked "Do you know the Bishop of Norwich" or "Do you know Jones of the sixtieth?" No one seems to know the origin of these questions but their purpose is to notify the person that they are supposed to pass the decanter. The years directly after World War I were some of the best for Port. In Britain, Port demand was huge, with Port & Lemonade being the favored drink in many pubs. As an example, in 1919 AD, England imported a record of 7 million cases of Port. During the late 1930s, after Prohibition, U.S. started to become a market for Port while French demand was starting to increase significantly. But World War II changed everything, almost bringing the Port trade to a stop, and even after the war it took many years for the Port industry to rebound. In 1946 AD, England imported only 2 million cases of Port, a drastic reduction from its post-World War I levels. As I noted in the first part of this series, in 2010, about 6.7 million cases of Port were produced, an amount which has been in decline. France is now the top importer, buying 28.5% while the U.S. only purchases about 3.9%, and it too has been in decline. It is time for Port to make a comeback, for a resurgence in popularity. It is time to consider Port as a wine for pairing with dinners, and not just chocolate and blue cheese. It is time to savor the delights of aged Port, from Vintage to Colheitas, from 20 Year Old to 40 Year Old. It is time to shatter the myths concerning Port and embrace this historic and delicious fortified wine. "Port is not for the very young, the vain and the active. It is the comfort of age and the companion of the scholar and the philosopher." As relations between England and Portugal grew even closer, England began to acquire significant concessions from Portugal to help maintain good trade relations. This created an imbalance of power, allowing England to dictate many terms to Portugal. As an example, the Commonwealth Treaty, which was established in 1654 AD gave English merchants greater power in the the city of Oporto than even the native Portuguese. For one thing, the treaty stated that no Englishman in Portugal could be tried by a Portuguese court, effectively placing them outside of the law. It is also during this century that some of the oldest Port houses were established, mainly by Englishmen. It is fascinating though that the earliest Port house was founded by a German and not an Englishman. In 1638 AD, Christiano Kopke of Germany formed CN Kopke & Ca Lda. It would not be until over thirty years later, in 1670 AD, that the Englishmen William Burgoyne and John Jackson founded Burgoyne & Jackson, which later would become known as Warre's. In 1678 AD, Mr. Croft from Yorkshire founded Phayre & Bradley (the name of its partners), later to be known simply as Croft. During the final quarter of the 17th century, Port first started to become a fortified wine, similar to what we now know it to be. It is alleged that in 1678 AD, at a monastery in Lamego, a village in the Douro, monks first began adding brandy to their wine. This brandy helped to stabilize and protect the wine during shipping and was sometimes known then as "priest-Port." This should not surprise anyone as monks have made huge contributions to the creation of some of the world's best wines, from Bordeaux to Champagne. The location of Lamego is also significant as that was where Afonso Harique's men first declared him to be King and he proclaimed Portucale to be a separate kingdom. Though some Douro wines would now start being fortified, it would still take a number of years before it became the norm. In addition, England still currently preferred French wines over Portuguese wines, though that would soon change. In 1678 AD, England, despite its close ties to Portugal, was only importing about 108,000 gallons of Portuguese wine, compared to over 3.7 million gallons of French wine. That imbalance would drastically change during the next few years. Starting in 1679 AD, because of years of constant conflict between England and France, England decided to ban the import of French wines. This was partially in retribution for an earlier French policy that that had effectively closed French markets to English cloth. Bad news for France, as well as French wine lovers in England, but it would be great news for Portugal. The initial ban of French wine remained in effect until 1683 AD and was then reinstated from 1689-93 AD. As a substitute for those French wines, England looked toward Portugal for replacement wines. So, in 1679 AD, England imported about 252,000 gallons of wine from Portugal, more than twice the amount of imports from the prior year. From 1682-85, total imports of Portuguese wines were over 3.5 million gallons, a huge increase. Even when the ban was lifted once again in 1693, a heavy tariff was still placed upon French wines, giving a significant advantage to Portuguese wines. It also helped that England was now acquiring Port, heavier red wines which met English tastes, and which they sometimes referred to as "blackstrap." Thus, as the 18th century began, Port was becoming extremely popular in England and it would be a golden century for Port. The Methuen Treaty of 1703 between England and Portugal, a commercial and military treaty, helped to spur on the demand for Port. The treaty was signed during the War of the Spanish Succession, when England, Portugal and other countries united against a possible unification between Spain and France under the rule of a French king. The treaty lowered tariffs on Portuguese wine, as well as English textiles, mainly wool, and made it much easier for the English to acquire Portuguese wine while England was at war with France. But even when hostilities ceased, the treaty continued to provide those same low tariff benefits, making Portuguese wines more enticing. The English power over the Port trade continued, and they used this power to control prices. In 1727 AD, English merchants formed a trade association and constructed the Factory House, also known as the British Association House, in Oporto. This was not an actual factory but a private gentlemen's club, where the merchants would meet to discuss how to control the wine trade. As one extreme example, it was said that some Portuguese growers, in an attempt to obtain good prices, had to prostitute their daughters to the English shippers. During the period of 1717-1777 AD, Portugal shipped about 10-12,000 barrels of wine to England each year, constituting about 2/3 of all the wine imported by England. Spain was another significant supplier, constituting almost 25%. England only imported about 4% of their wine from France. So it is easy to see how much Portuguese wine was consumed in England, especially Port. It became a sign of manliness of how many bottles of Port you could drink in one sitting, or during a day. It was a sign of pride to be a "three-bottle man," able to consume three bottles of Port at one time. There were even a smaller number of "six-bottle men." At an extreme, the classical scholar Dr. John Porter was said to drink thirteen bottles of Port every day. We should note though that port bottles were smaller then, had less alcohol, and usually plenty of sediment at the bottom of each bottle. As for alcohol levels, in the early 1700s, only about 3% brandy was added to Port though that percentage increased over time so that by 1820 AD, it had risen to about 22%. Obviously Portugal was displeased with the power imbalance and would eventually find a way to wrest control back from England. Those changes had their origins in 1750 AD, when Sebastião José de Carvalho e Melo, the Marques de Pombal, returned to Portugal after having spent time as the Portuguese ambassador to London. Upon his return, Portugal King José I rewarded Pombal for all his good work, making him Minster of the Kingdom, essentially a Prime Minister. Pombal's position gave him much power, and used it for the benefit of the country in many ways, from abolishing slavery to significant economic reforms. In addition, he helped to bring about major changes in the wine industry. Obviously, not everything he did was welcomed or considered positive, but his impact cannot be ignored. Because England wanted so much Port, the producers found themselves unable to meet the demand. Thus, some unscrupulous producers began to adulterate their wines, creating false Port, to meet the demand. Elderberry juice was a common additive. The English were smart enough to realize they were being scammed and there was much tension. Pombal knew that he had to remedy this problem and to do so, in 1756 AD, he formed the Companhia Geral da Agricultura e Vinhos do Alto Douro ("General Company of Agriculture of the Wines of the Upper Douro"), which was more commonly known as the Douro Wine Company. The purpose of this company was to regulate the Port industry, to guarantee the quality of the wine, as well as to wrest control of the industry out of the hands of the English. The company also established the geographical boundaries for the Douro region, making it the third oldest protected wine region in the world after the Tokaj-Hegyalja region in Hungary and Chianti in Italy. But, it may be the first actual wine appellation, as unlike the other two regions, the Douro was also subject to government rules and regulations. The regulations touched on many different aspects. For example, it helped delineate which areas could not produce grapes, generally those lands which were needed to grow corn, a vital food crop. The rules prohibited the addition of elderberry juice, or other adulterants, to Port and even required that all elderberry plants had to be destroyed in the Douro. Vineyards were divided into two main types: vinhos do ramo and vinhos da feitoria. Vinhos do ramo means "branch wine" and refers to the tradition of identifying taverns by seeing a branch hung outside of them. These are wines primarily intended for domestic consumption. The vinhos da feitoria were the higher quality wines, those destined for export, mainly to England. All of the company's regulations helped to give Portugal back most of the control of the wine industry, which angered England yet there was not much they could do about it. They still possessed a great desire for Port so they dealt with the situation as best as they could. Chef Kevin Long impressed me with his efforts at Red Lantern, an Asian restaurant and bar on Stanhope Street. So, when I and a guest received an invite to check out one of Chef Long's newest endeavors, GEM Restaurant & Lounge, I was intrigued. GEM, located downtown in the Jeweler’s District next to Sam La Grassa's sandwich shop, opened in March and is part of the Big Night Entertainment Group, which includes other restaurants such as Empire, Shrine, and more. GEM is self-described as a "fusion of gastro-lounge and ultra exclusive supper club." It is supposed to possess the ambiance of a "private dining supper club" and provide a "sophisticated take" on comfort food. To me, this creates certain expectations about the cuisine, that it will be above average in quality and execution. The dining room is small, possessing only 36 seats, and it is reservation only. It is elegant and possesses an appealing, old-fashioned and intimate feel. It would be perfect for a romantic date or an elegant dinner. For a "private dining supper club," I think the room does seem special and provides the right vibe. On a Wednesday evening, it was relatively quiet, with only a few tables occupied. The wine list is relatively small, with about 25 wines by the bottle and 15 by the glass. The least expensive bottle is $50, with 10 bottles over $100, and glasses generally run $11-$14, though you can also order a glass of Dom Perignon Champagne for $45. Cocktails and martinis generally range from $12-$18. I tried the Province St. Smash ($12), a blend of Maker's Mark, ginger beer and peach bitters, and was impressed, especially as it was not overly sweet and had a balanced taste of vanilla, peach and ginger. It is a cocktail I would order again. I also had a Hurrikane ($12), made with 10 Cane Rum, Myer's Dark, orgeat, pineapple and orange. This will remind you of a Mai Tai, and tends to be a bit sweet and fruity. The food menu is essentially plenty of comfort foods, with 10 Firsts (appetizers) priced $9-$18, 7 Mains priced $15-$31, 4 Sides priced $6-$8, and 3 Bar Bites priced $5-$6. There were also a few Specials on the evening I dined there. My dining companion has some food allergies and called the restaurant ahead to make them aware of it. When we arrived, the restaurant was quick to raise the issue, pointing out which dishes to avoid, while also noting that the chef could revise some of the dishes to avoid the allergy ingredients. They deserve kudos for their attentiveness to this significant issue. I began my meal with the New England Lobster Chowder ($16) which is topped by a large shrimp tempura. The chowder was very creamy, spiced well, and bursting with flavors including a nice smokiness. There was lots of bacon within it and the tempura was good, though the coating lying in the chowder lost its crispiness. The chowder was also perfect for dipping my bread. Excellent comfort food with a sophisticated twist, the type of dish I would expect to find here and a good start to the meal. We also began with the Salumi Board ($15), though I will note that we did not get the usual pork rillette because of my companion's allergies. Unfortunately, most of the charcuterie is not done in house, except the rillette though they do rehydrate their figs and peaches. The various meats were tasty, as well as spicy, but this is the same type of dish you can find in many other restaurants. It would have been much better if all of it was made in house. There was nothing wrong with the taste, but it is just an average and commonplace dish, lacking a sophisticated twist. A similar problem plagued my entree, the Penne Bolognese ($23). I am a huge fan of Bolognese so figured I had to try it here, especially as the ragu included beer and wild boar. It was good, with plenty of tender meat, but nothing special, and I wasn't keen on the apparent slices of zucchini in it. Plus, some of the pasta seemed a bit overcooked, not al dente enough. I have had much better Bolognese in many other places. Again, it was an ok dish, but it lacked anything to elevate it beyond the commonplace. I would not be motivated to order it again or recommend it to others. The Roasted Sea Bass ($31) is made with white miso and soy, and its flavor was superb. Just the right amount of sweetness, offset by the salty umami of the soy, and the fish was cooked perfectly. This dish comes with only some pea shoots, and I feel the price is a bit high for the quantity of food you receive. For sides, I tried the Mac & Five Cheese Gratin ($8) which might have been my favorite dish of the night. Cooked perfectly, with a crispy top of buttered breadcrumbs and rich, cheesy noodles, this was the perfect comfort food, elevated to a high level. Nice levels of flavor, this bests many other mac n' cheese dishes you will find elsewhere. This dish gets my highest recommendation and I would probably order it every time I visited GEM. The House Fries ($8) are made with truffle butter, Piave and herbs and should have been good but most of the fries were tiny pieces, as if they were the remnants of a batch. They were not the typical length fries you get elsewhere, which are easy to pick up with your fingers. The taste was there, but failed in the execution. From the Bar Bites, we chose the Warm Potato Chips ($5), which come with a caramelized onion dip. But we didn't need the dip, savoring the warm chips on their own. They reminded me of the home made chips I had in my home when I was a child. Great crispness, lots of flavor, and they were not greasy. Another winning dish. For dessert, there is usually only a single, rotating option and on the night of my visit, it was an Irish Whiskey Tiramisu, which we didn't choose to order. Instead, they gave us some macerated fruit with a balsamic and Kahlua reduction, and it was pleasant. I have mixed feelings about GEM, especially as it has been open long enough to have worked out its initial kinks. I feel the menu and some of the dishes need some work. For an "ultra exclusive supper club" with a "sophisticated take" on comfort food, I have certain expectations that the cuisine should be elevated above merely average. Plus, at their price points, you expect something special. A few of the dishes met this high standard, but others failed. If I desire high quality comfort food, I want something more unique, a reason to choose one restaurant over another. GEM has potential, but it has not yet realized its full potential. In a previous post, I discussed the beverages I enjoyed at the 4th Annual Vermont Cheesemakers’ Festival at Shelburne Farms. Presented by the Vermont Cheese Council, the event showcased over 40 Vermont cheesemakers, presenting more than 200 Vermont cheeses for sampling. For a cheese lover, this is a smorgasbord of dairy pleasures, the delicious products of local cow, sheep and goat milks. There was a vast diversity of cheeses, from chèvre to blue cheese, from cheddar to mozzarella. Besides all these cheeses, there were other foods as well, from candy to croutons, breads to hot sauces. In this post, I am going to highlight some of the cheeses and other foods which most interested me. I did not taste all of the cheeses and foods that were available, though I have tasted a number of them on prior visits. I recommend you check out the Cheesemakers Festival next summer. One of the first items I tasted at the festival were some of the Whitney's Castleton Crackers. The crackers are supposed to be all natural, hand made and hand cracked. They have about a half dozen different flavors, and their newest is Cabot Clothbound Cheddar (which is not even listed yet on their website). I am a huge fan of this cheese so was intrigued by this cracker. The cracker is very firm, which is good if you want to spread something on it, and it had a nice, strong cheddar taste to it. They have enough taste that you could enjoy them on their own, though if you wanted to top them with something, the cheddar flavor would complement the topping. On one of my prior trips to the Festival, one of my favorite cheeses was the Grafton Clothbound Cheddar from Grafton Village Cheese. I stopped at their table this time and they were presenting several of their Cave Aged cheeses. The Cave Aged Vermont Leyden is historically produced in the Leiden area of the Netherlands, where it is known as Leidse Kaas. It is a cow's milk cheese which has been aged for at least two months. It had a bold and buttery taste with an intriguing herbal component from the addition of cumin. The Cave Aged Bismark is named for a legendary Vermont ram from the late 19th century. It is a sheep's milk cheese that has been aged for at least three months. The Bismark has an intriguing taste, nutty, creamy, and with a zippy tang on the finish. They also have a Cave Aged Truffled Bismark which was even more impressive, adding a delicious earthiness due to the addition of white and black truffles as well as some truffle oil. This would be a perfect cheese for an umami rich Sake, like a Kimoto or Yamahai. The Vermont Farmstead Cheese Company is devoted to sustainable dairy farming practices and is opening a new production facility and aging cave in Windsor, Vermont. They raise a mixed herd of cows including Ayrshires, Brown Swiss, Holsteins, Jerseys, and Red & White Holsteins. This was their first year at the Festival. Smoked Brickhouse Tilsit, of Danish ancestry, was a firm cheese with a smoky and spicy taste, yet with a creaminess as well. The Windsor Dale uses an 1800 recipe of an Old English farmhouse cheese and was quite intriguing, possessing a fruity taste complemented by a mild sweetness. The Boston Post Dairy is a small family run farm and all of their cheeses are made with goat's milk. The farm is owned by Robert and Gisele Gervais and their four daughters. Robert and Gisele also have eleven boys, quite a large family.Their Feta was compelling, with a nice texture and a mild, creamy taste. It would be great with watermelon or over a salad. The Tres Bonne is a semi-hard goat cheese with delicious buttery and nutty elements, and an element of creaminess. The Eleven Brothers, named after their actual eleven brothers, is a semi-hard, washed rind goat cheese, reminded me of an aged cheddar and was quite tasty. Even their Plain Chevre was fresh, light, clean and extremely creamy. It is one of the better Chevre I have tasted in awhile. Vermont Shepherd Cheese is made on a 250 acre farm that raises 300-700 sheep, dependent on the season. Their cheese is made seasonally, such as the Verano (summer cheese) and Invierno (winter cheese). I tasted the Invierno, a blend of cow and sheep's milk, the cow milk coming from the nearby Livewater Farm. It is a natural rind cheese that is aged from 5-9 months in their own cave. The cheese had a firm texture with bold flavors of butter, nuts, grass and even herbal hints. Quite an interesting blend of flavors. The Bonnieview Farm is a sheep dairy and they make several different sheep's milk cheeses. The farm has been in the family since 1890. Their Mossend Blue is a medium pungent blue, with a firm yet crumbly texture, and a pleasant, mild taste. The Seven Brock Blue has a much stronger flavor, which I enjoy, so it was my favorite of the two. Give me a nice glass of Port and I would be very happy. I have raved before about the goat's milk caramel sauces from Fat Toad Farm and they had a new flavor at the festival, Salted Bourbon Caramel. All I had to do was see that flavor, and I knew I had to taste it. and it lived up to my expectations, with that sweet, creamy flavor complemented by a salty element and the vanilla from the bourbon. Pure heaven. You must try their caramel sauces. More caramel delights! Big Picture Farm is a goat dairy and they make goat's milk caramels. It is a relatively new farm, having started in 2010. I tasted two of their hand-made caramels, the Chai and Vanilla & Sea Salt. The Chai was spicy, with a nice cinnamon and nutmeg kick, and it was not overly sweet. My favorite though was the Vanilla & Sea Salt, just bursting with creamy flavor, prominent vanilla, that great salty contrast and just the right amount of sweetness. These are very addictive. "A corpse is meat gone bad. Well and what's cheese? Corpse of milk."